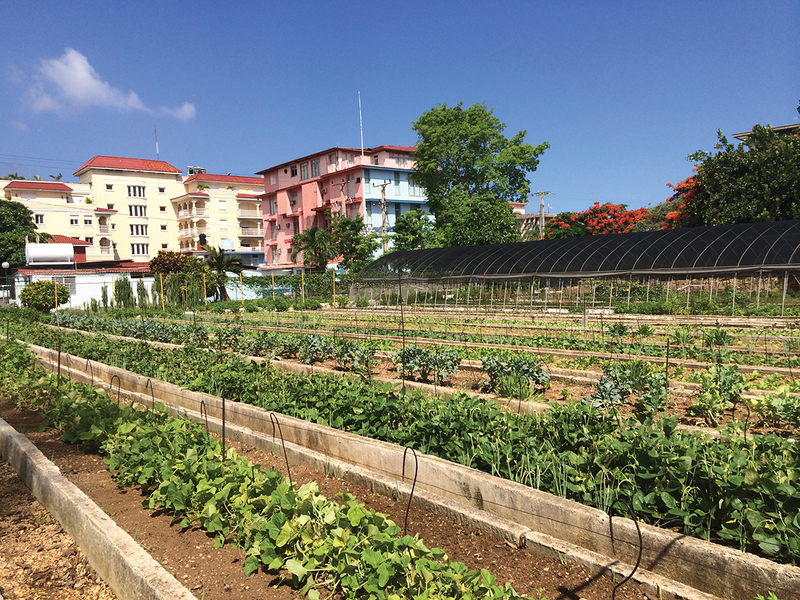 One of the largest raised-bed urban agriculture sites, or oganopónicos, in La Habana. It is located in an affluent area on the border of the city’s downtown area. Photo: Sara Law. Today, the United States of America is changing its relationship with the people of Cuba. In the most significant changes in our policy in more than fifty years, we will end an outdated approach that, for decades, has failed to advance our interests, and instead we will begin to normalize relations between our two countries. Through these changes, we intend to create more opportunities for the American and Cuban people, and begin a new chapter among the nations of the Americas. I have hesitated to discuss Cuba–U.S. relations in my work in an effort to distance myself from the Western-centric dialogues around Cuba, and to avoid Cold War clichés. However, as the months roll by and more news articles are released about Cuba–U.S. involvements, I would be remiss not to mention the impact this normalization will have on food and the politics of food. I have heard different accounts of why there is no fish. Some say that it is because Cuba has a trade deal with other countries for fish, others say that the state is purposely holding out on La Habana markets. Rumors in Cuba are often closer to the truth than the “Truth” is. However, on December 17 it was reported by Yoani Sánchez, the famous and often controversial female Cuban blogger, that there was finally fish for sale. What she wrote has stayed with me for the entirety of my thesis: ¿Oigo los discursos o compro el pescado? / Do I listen to speeches or do I buy fish? 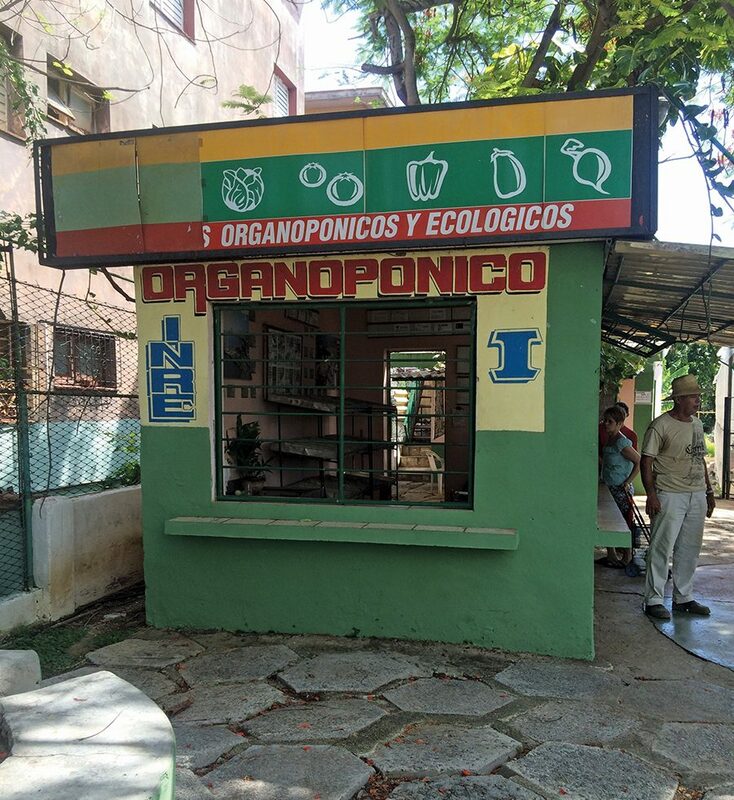 This organopónico stand is adjacent to one of the largest urban agricultural sites nLa Habana and sells directly to the consumer. Photo: Sara Law. This accurately sums up an argument that I have been grappling with during my master’s research. How do I address the complicated, contentious, and inseparable strands in the web of food and politics? Should they be placed at odds with one another? Do we listen to speeches, or do we buy fish? Maybe we should do both. Food is political. Cuba’s economic crisis, the Special Period, was brought on by a set of political decisions of the Cold War that ultimately brought Cuban society down to its most basic living conditions. This crisis that has haunted Cuba since the 1990s was marked by the collapse of the cattle industry, the near failure of the agricultural industry, and the meagerness of rationings that led to rampant food insecurity. A set of historical, political moments set into play some of the leanest years in Cuba. The normalizing of relations brought back fish. I cannot ignore this. Food is political. Apparently, I am not the only one who thinks so. In the months following Obama’s announcement, National Public Radio (NPR), the New York Times, and several Cuban blogs brought food politics and agriculture to the forefront of the normalization of Cuba–U.S. relations. This is to say that food is increasingly being recognized as a conversation that is inextricably linked with the political. The day after President Barack Obama announced a new chapter in Cuban–U.S. diplomacy, NPR ran the story “What the Change in U.S.–Cuba Relations Might Mean for Food” (Barclay 2014). It addressed the “jigsaw” nature of Cuba’s food markets and currencies, the lack of beef and fish, the potential for trade with the American Farm Bureau, and what this trade policy could mean for the future of Cuba’s food. Not even a month later, NPR ran another story on a recent initiative led by Miami Cuban-American chef Douglas Rodriguez to take Americans on a culinary tour of La Habana (Vidal 2015). In the beginning of March, the New York Times published a hopeful piece on the promise of increasing agricultural trade relations. The article highlights a bipartisan group of U.S. senators who are working to introduce a bill to end the embargo, with clear farm and business backing. These articles portray a refreshing reality about Cuba–U.S. relations. They are not counting down the days until McDonald’s establishes its bright yellow arches on the Malecón. They exercise restraint and a measure of respect for Cuba’s agency in the matter. John Kavulich, president of the U.S.-Cuban Trade and Economic Council, cautions, “What people tend to forget is it’s not what the U.S. wants to do to for Cuba. It’s about what Cuba feels is in its interest” (Barclay 2014). This is a clear divergence of thought from even twenty years ago, when Cuba was portrayed as a helpless island waiting for the United States to save it from itself. Row of Cuban trucks bringing in their produce into the Trigal, a large agro-market on the outskirts of La Habana during the summer months. Photo: Sara Law. This is a common sentiment I heard while I was in La Habana. Many Cubans long to brush off their dusty cookbooks and try their hand at recipes they have long since forgotten due to the lack of ingredients. Items like beef and fish have been calling high prices on the black market. As I mentioned earlier, fish has been missing from the Cuban markets for many years with the exception of December 17, 2014. Beef is rarely seen in the markets because Cuba’s cattle population has suffered severely since the Special Period and is now dwindling. There are even rumors now that the state will replace cattle with water buffalo, a hardier breed but just as tasty. There have been many attempts to increase the cattle industry’s numbers, but the climate and poaching have impaired its ability to sustain growth. Ropa vieja, a traditional Cuban meal made with beef, is now a delicacy in paladares—private Cuban restaurants—instead of being served in the household. This movement toward analyzing food politics and sustainability is an affirmation that, as a feminist critical food scholar, I am not crazy for spending two years of my life reading, living, and breathing this topic. However, there are clearly broader implications for the discussion of food politics than my own self-satisfaction. Until recently, food has been relegated to the private, the domicile. The process of buying, preparing, and consuming food was considered within the realm of women’s work and unworthy of academic (or any) attention. In the past few years, scholars like Pollan (2007), Guthman (2007, 2008), and Alkon (2014) have brought the politics of food and food access into the public sphere. In the United States, food justice advocates have battled against inequalities in the food system and called for a global structural shift in how we understand, produce, and consume food. This movement is happening in a primarily local, Western urban sphere and encourages grassroots sustainable food systems in low-income communities of color. Advocates in the United States have called for a global structural shift in how we understand, produce, and consume food. Additionally, scholars like Harper (2011) and Slocum (2007) have addressed how food implies more than a biological need to survive but also a political process that interweaves lines of race, class, gender, and culture. However, there are crucial issues that we have ignored, like the loss of farmland for Indigenous, Latino, and Black farmers, the vulnerabilities of workers’ rights in industrial agriculture, and the insecurity of urban land for food production. Cuba’s relationship with food has historically been political, evidenced by the emergence of a sustainable, organic agricultural model to mitigate the effects of the economic crisis of the 1990s. The Cuban government appropriated the once grassroots urban garden movement to become a symbol of the resilience of the Cuban people and the ideology of the Revolution. The sustained conversations of Cuba–U.S. relations regarding food bring hope, not only for the future of food access on the island but for the trajectory and recognition of food politics in Cuban society. However, we are not there yet. Despite reports of Netflix, Airbnb, and MasterCard coming to the island, the embargo is still in place as of this writing. There have been great strides, like the easing of travel sanctions, talks to establish embassies, the release of Alan Gross, and the removal of Cuba from the terrorist list, but we are still waiting on Congress and that could be a long wait. Yoani Sánchez jokes, “Cuba is changing at the speed of a tortoise that flies by clinging to the legs of an eagle.” While we wait to see what implications the normalization of relations might bring (perhaps more fish? ), I ask that we continue to critically interrogate socio-political structures of food in Cuba as well as in our own communities. Sara Law graduated with her MA from LLILAS in spring 2015. She is currently working as a community engagement coordinator for the Sustainable Food Center in Austin. 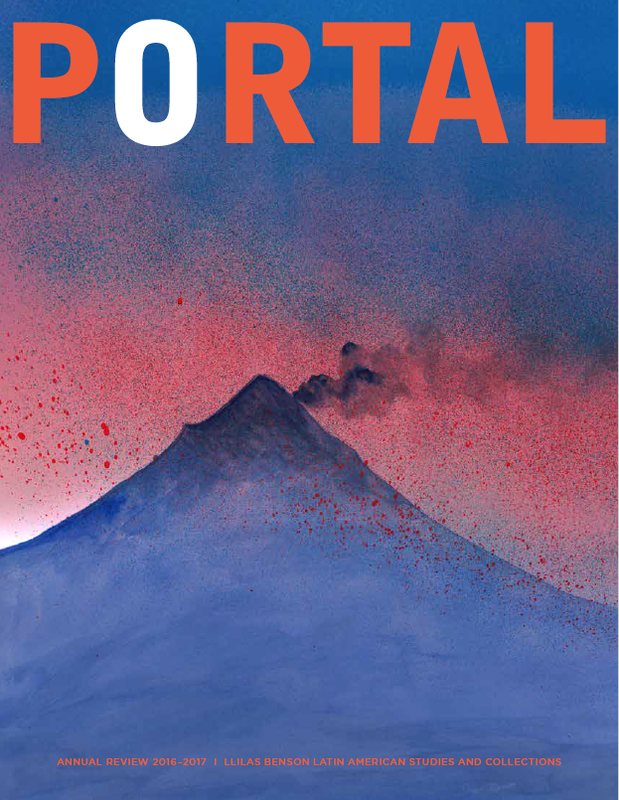 This article originally appeared in the 2014–2015 edition of Portal. Alkon, Alison Hope. 2012. Black, White, and Green: Farmers Markets, Race, and the Green Economy. Athens: University of Georgia Press. Barclay, Eliza. “What the Change in U.S.– Cuba Relations Might Mean for Food.” National Public Radio, December 18, 2014. “Cuba Looks North to US Farmers to Help with Food Crisis.” New York Times, March 4, 2015. Available at AG Web. Harper, A.B. 2011. “Vegans of Color, Racialized Embodiment, and Problematicsof the ‘Exotic.’” In Cultivating Food Justice: Race, Class, and Sustainability, ed. A.H. Alkon and J. Agyeman. Cambridge, MA: MIT Press. Guthman, J. 2008. “‘If They Only Knew’: Color Blindness and Universalism in California Alternative Food Institutions.” Professional Geographers 60: 387–97. ———. 2007. “The Polanyian Way? Voluntary Food Labels as Neoliberal Governance.” Antipode 39 (3): 456–78. Pollan, Michael. 2006. The Omnivore’s Dilemma: A Natural History of Four Meals. 1st ed. New York: Penguin Press. Sánchez, Yoani. “Has D-Day Arrived?” Generación Y, December 17, 2014. ———. “The Day Peace Broke Out.” Generación Y, March 25, 2015. ———. “What Will We Do with the Hope?” Generación Y. February 3, 2015. Slocum, Rachel. 2007. 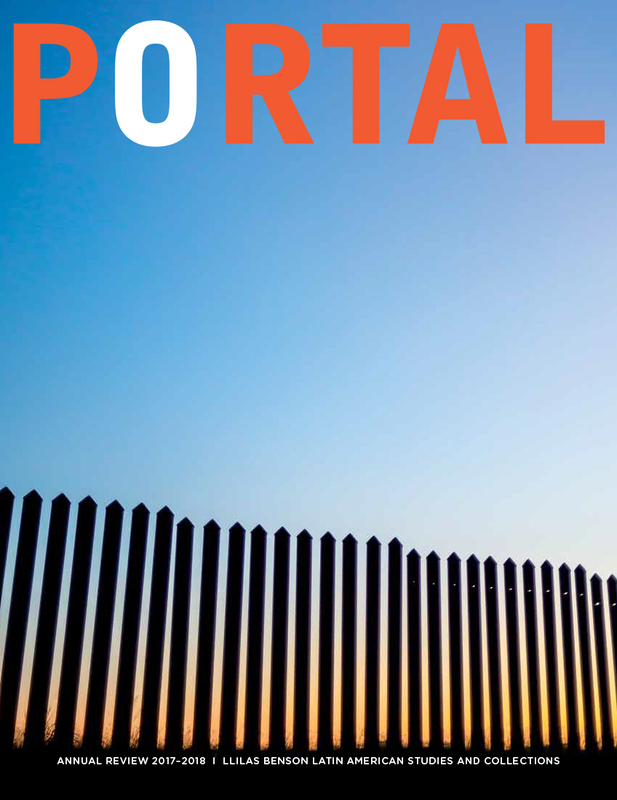 “Whiteness, Space and Alternative Food Practice.” Geoforum 38 (3): 520–33. Vidal, Juan. “Mojito Diplomacy: Chefs Plan Culinary Tours to Cuba.” National Public Radio, January 15, 2015.